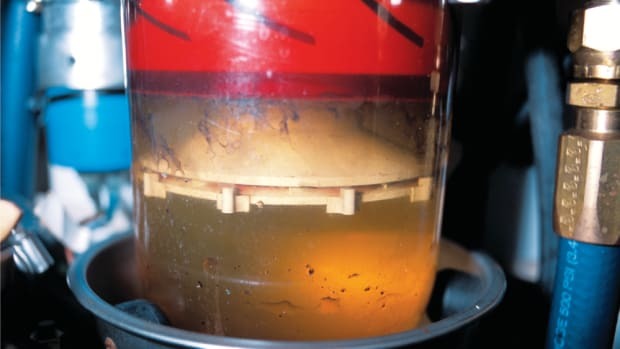 Regarding Steve&apos;s response to the "Cool Your Fuel" letter in the September issue, I think he missed the crux of the question: how to avoid heat buildup in the fuel tank. Steve&apos;s recommendation of installing a fuel cooler before the raw-water pump and plumbing fuel through it after the primary fuel filter and before the engine&apos;s lift pump would certainly help provide cool fuel to the engine. However, it wouldn&apos;t keep the tank itself from becoming, as Mr. Miller put it, "a very large heat sink." I, too, have the problem of heat buildup in my boat&apos;s fuel tank, and I think Mr. Miller is on the right track with the idea of placing the fuel cooler in the return line. This would keep the tank itself cool and also ensure that the engine is supplied with cool fuel. Also, if the heat exchanger is installed before the raw-water pump, any internal breach could result in one fluid passing into the other. With the cooler before the pump, fuel could be drawn into the raw-water stream. The loss of fuel, at least initially, would be miniscule and likely would not be noticed until a mysterious increase in fuel consumption was recognized. While it&apos;s easy enough to pressure-test a heat exchanger, it would be so low on the list of suspects that a lot of resources could be needlessly expended looking in other areas. Further, a serious breach in the fuel cooler could allow enough fuel to enter the raw-water stream as to create a dangerous situation in the exhaust pipe or turbo cooler. The fuel could vaporize and explode. Placing the fuel cooler after the raw-water pump might allow water to enter the fuel stream, but with the cooler in the return line, the water would go back to the tank and would ultimately be removed by the fuel filter. As the breach worsened, excessive water in the fuel would become apparent fairly quickly, with the fuel cooler being the likely source, especially if you haven&apos;t taken on fuel recently. With fuel heating, the primary concern is the temperature of the fuel when it reaches the engine&apos;s combustion chamber. Thus, the most common approach taken by engine manufacturers to improve efficiency in the combustion process is to cool the fuel before it enters the injection pump and injectors. To my knowledge, no engine manufacturer cools return fuel, for one primary reason—it&apos;s like trying to use a windshield squeegee to keep waves from rushing to the shore. The tanks and the fuel within will absorb heat from the engine compartment, regardless of how much the fuel is cooled on the return path. If the goal is to improve engine efficiency by cooling the fuel, the most effective way to accomplish this is to cool it as it enters, rather than leaves, the engine. If your goal is to cool the tanks, you could certainly attempt to do so by cooling the return fuel as well. The results, however, will depend greatly on the quantity of fuel pumped and the ambient temperature of the engine room. Fuel coolers sometimes are placed on the inlet side of raw-water pumps and sometimes on the pressure side, depending on the engine manufacturer and model. (The cooler design itself often differs, depending on its intended location.) As you noted, if the cooler is placed after the pump, a breach between the fuel and raw-water circuits will result in fuel leaking into the raw-water stream and being pumped overboard. This is environmentally unfriendly, but the user likely will notice this quickly due to increased fuel consumption and the telltale slick. Because of the volume of water involved and the scarcity of oxygen, the risk of an explosion in the exhaust system is slim. If the cooler is placed on the pressure side of the raw-water pump, the same breach will result in sea water being pumped into the fuel system or fuel being pumped into the raw-water system, depending on which system&apos;s pressure is higher. The secondary fuel filter will quickly be overwhelmed, as most are not designed to deal with a large volume of water. The good news is, you&apos;ll know you have a leak pretty quickly. 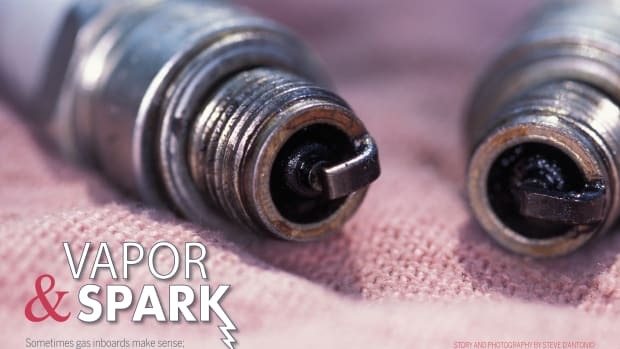 The bad news is, you&apos;ll find out because the engine will stop operating, possibly as a result of a scored, seized, or otherwise severely damaged injection pump or injector. Fortunately, failures in fuel coolers are rare. In addition to being perhaps the best technical expert on all things nautical, Steve D&apos;Antonio is a gifted writer, as illustrated by his article on the Faroe Islands in PMM&apos;s e-newsletter ("Venture II Ventures North," The Newsletter, Aug. &apos;10). And that&apos;s also why Steve is such a good technical expert—he not only knows his stuff, he also is an excellent communicator. Thank you, Steve, for all your articles, and keep up the good work.